Price: £4.20 (incl VAT) Sorry, this item is currently unavailable. Click here to receive notification when this product comes back into stock. 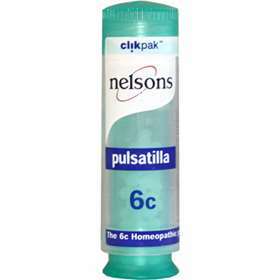 Nelsons Pulsatilla 6c is a natural homeopathic remedy made using pulsatilla nigricans, commonly known as wind flower. Nelsons Pulsatilla 6c is indicated to help various childhood, menstrual and chronic ailments. Press base hard to break seal. Press base twice to release 2 Nelsons Pulsatilla 6c pillules into cap. Tip pillules directly from cap into mouth without touching them. Pillules should either be chewed or placed under the tongue until dissolved and be taken between meals. Adults and children to take 2 pillules every 2 hours for the first 6 doses, then 4 times daily for up to 5 days or until symptoms improve. If pregnant or breastfeeding, consult your doctor before use. If you forget to take this product, continue to take your usual dose at the usual time. It does not matter if you have missed a dose. If you take too much of this product, speak to a doctor. If symptoms worsen or persist for more than 7 days, or if you experience any unusual or unexpected effects, speak to your doctor or homeopath. Nelsons Pulsatilla 6c contains lactose and sucrose. If you are allergic to any of the ingredients in this medicine, consult your doctor before use. If you are taking any other medicine, including those bought without a doctor's prescription, consult your doctor or pharmacist before taking this medicine. Pulsatilla Nigricans 6c, Lactose, Sucrose. Product code: 0245944 Price: £4.20 (incl VAT) Sorry, this item is currently unavailable. Click here to receive notification when this product comes back into stock.